Yesterday marked the 72nd anniversary of Indonesia’s independence, but you can still celebrate the occasion by taking a bite out of the culinary diversity found across this nation of 17,000 islands. Here are 10 regional dishes drawn from across the archipelago, and recommendations on where to eat them in Jakarta. 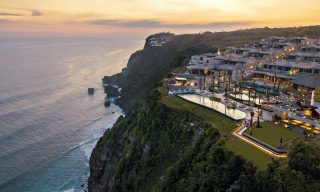 Calm and tranquil, Lombok’s stunning coastal scenery is contrasted by its hot, fiery cuisine. The island’s most famous edible export is perhaps ayam Taliwang (Taliwang chicken): charcoal-barbecued chicken topped with a mouthwatering and addictive sambal (chili salsa). 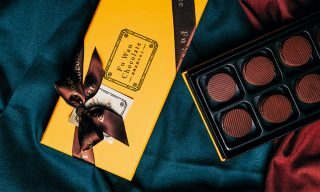 Made with chickens no older than three months, the meat is extra tender and juicy. It’s paired perfectly with the bright sambal made with chilies, garlic, shallot, tomato, shrimp paste, aromatic ginger, and palm sugar. Even if you don’t like spicy food, give ayam Taliwang a try—you just might become a convert. 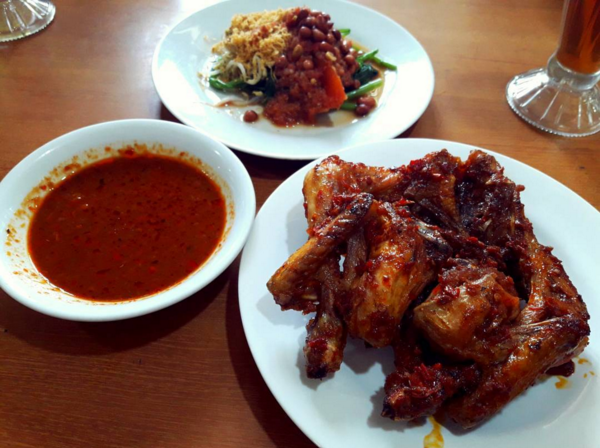 Due to its recent surge in popularity, you can find this Lombok specialty in restaurants such as Ayam Taliwang Lima Rasa on the main avenue of Jl. Dr. Satrio, and Rumah Makan Taliwang Bersaudara in Tebet, both in South Jakarta. 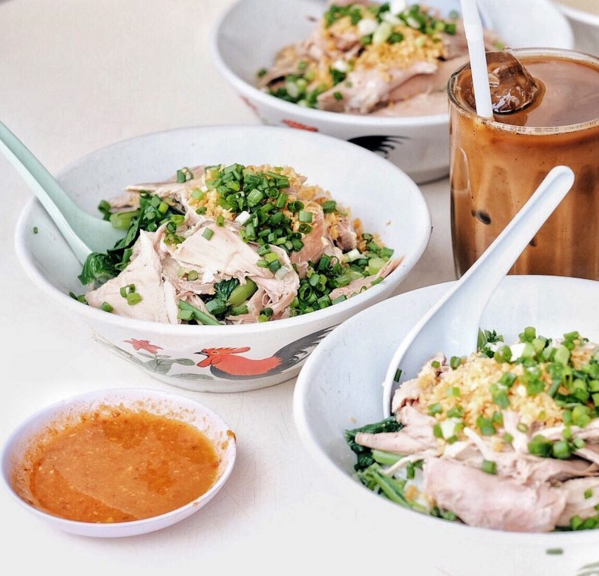 While it’s not as famous as the ubiquitous mie ayam (chicken noodles), bihun bebek is a dish worth trying by those who want to get a better understanding of the country’s varied cuisine. A specialty of the North Sumatran city of Medan, bihun bebek is composed of fine rice vermicelli topped with tender slices of slow-cooked duck, sprinkled with crispy fried garlic, garnished with spring onion, and served alongside a rich duck broth. The best way to enjoy bihun bebek is to immerse the noodles into the broth and slurp away—no Indonesian will think any less of you. It’s pretty under-the-radar, at least in Jakarta, so establishments that serve this mouthwatering Chinese-Indonesian dish in the capital come few and far between. If you’re only stopping by the Big Durian however, and you really want to give it a try, visit Bihun Bebek 75 in the North Jakarta neighborhood of Pluit. If you find yourself in Medan however, stop by the local favorite on Jalan Kumango: Bihun Bebek Asie. In Padang restaurants, you’ll likely find dendeng balado—the archipelago’s take on beef jerky, topped with spicy red salsa. If you’re lucky however, you may find dendeng batokok, the sister to the former that may just be the prettier sibling. 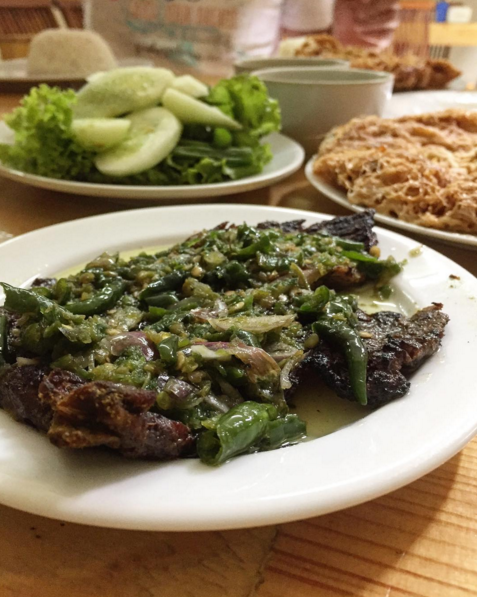 Topped with a green chili salsa as opposed to the typical red one, dendeng batokok’s meat is juicy and succulent, while that of the balado’s is dried. The salsa is also fresher thanks to the addition of green tomatoes and green chilies. 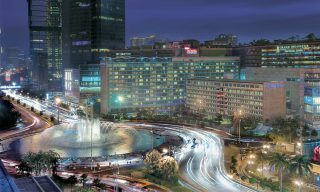 To get a taste of dendeng batokok while in Jakarta, head to Kota Kasablanka mall and make a beeline for Sate Padang & Dendeng Batokok Salero Uni. Sundanese is one of the archipelago’s most beloved cuisines, thanks to its blend of simplicity and freshness. Preparation is relatively painless, while the ingredients commonly used—such as tempe, tofu, and fresh-water fish—can be found nearly everywhere in the country. One Sundanese dish that stands out in particular is the bright yellow ikan pesmol (pesmol fish). It’s a deep-fried fish smothered with a paste of garlic, shallots, candlenut, aromatic ginger, coriander, and turmeric. The fish, which can be mackerel or carp, is tasty, but the marinade alone tastes wonderful when paired with a plate of steamed rice! In comparison to other well-known Indonesian dishes, ikan pesmol is much simpler yet just as delicious as the other more complicated ones—you can even whip it up yourself at home. 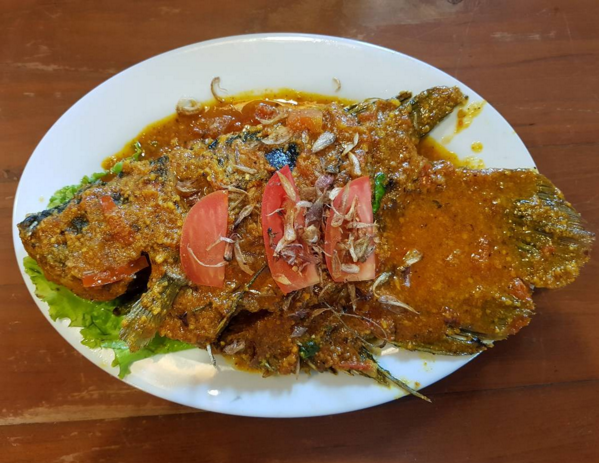 A recommended place to try the dish is Ikan Bakar Cianjur, a nationwide restaurant chain which has branches in Central and South Jakarta. Other countries may have birthday cakes, but Indonesia has nasi kuning (yellow rice). Served as a conical mound of turmeric-scented rice surrounded by a selection of dishes, nasi kuning is the center of celebrations, but is also the breakfast of choice for many locals. While the most common and widespread variation of nasi kuning is arguably the Javanese kind, North Sulawesi has its own take on the traditional dish. Not all that different in appearance, what sets nasi kuning Manado apart from its famous cousin is its sides of spicy, shredded cakalang (skipjack tuna), semur beef stew, thinly sliced fried potatoes, a hard-boiled egg, and sweet and spicy sambal (often made using roa, or red-tipped halfbeak), all wrapped in the leaf of a woka fan palm. This version of nasi kuning is so tasty, some local airlines have even added it to their menu. The great news is, once in Jakarta, you don’t have to get on a plane to sample it—visit the southern foodie’s haven of Cikajang for a meal at Nasi Kuning Cakalang Manado OMA, or if you’re planning a diving trip to Manado itself, a recommended spot is Nasi Kuning Selamat Pagi Kampung Kodo, just behind the Manado Bersehati Hotel. 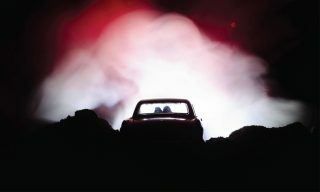 After all, there’s nothing like going right to the source. Rice is the staple food of western and central Indonesia, but that’s not the case in the eastern islands of Maluku and Papua. In these two regions, the mainstay of the dinner table is papeda, a viscous congee made from the trunk of the sago palm tree. Similar to Malaysia’s linut, it’s made by cooking sago starch with water until it coagulates. 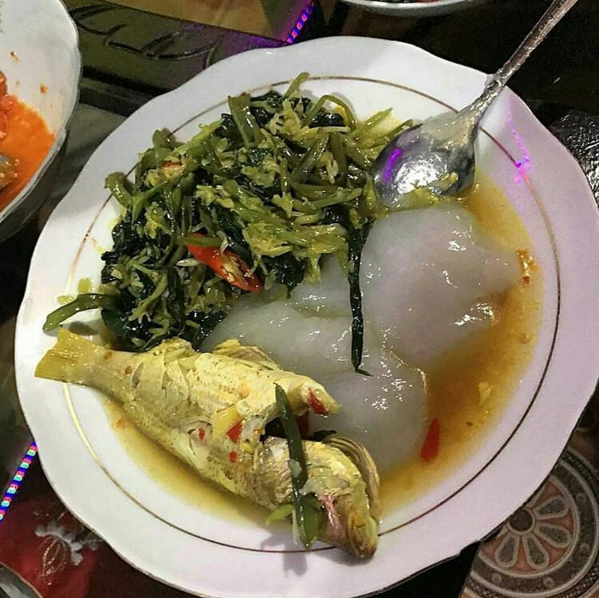 Papeda is typically served with a tart yellow soup made with turmeric, lime, fish, and served with starchy tubers and various vegetables, making it a unique combination of textures and flavors that is just as Indonesian as nasi goreng. While it’s a bit difficult to find in Jakarta, it’s certainly worth looking for. You can visit Yougwa Restaurant in the northeastern neighborhood of Kelapa Gading to try this unusual dish. Don’t be put-off by its devilishly dark coloring—this dish is heavenly. 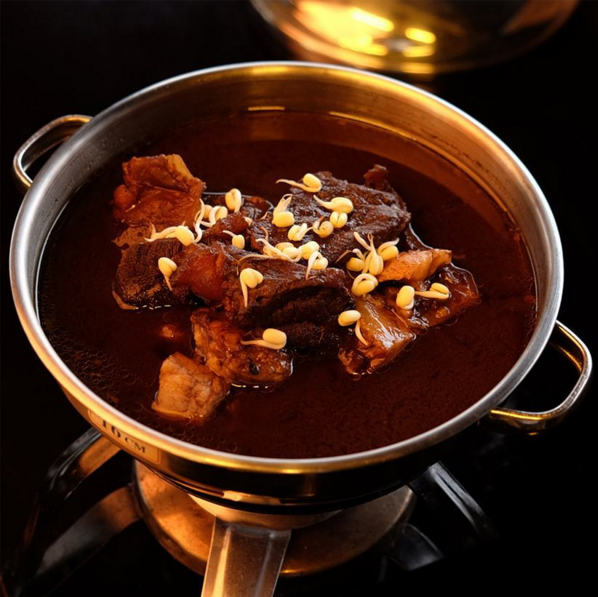 Originating from Surabaya in East Java, rawon is one of the island’s most-loved beef stews. What gives rawon that distinctive inky black color is keluak, a fruit from a species of mangrove native to Southeast Asia, called kepayang. The kepayang’s fruit is laden with cyanide, which explains why it has to undergo a lengthy fermentation process first before it can be cooked. The end result: a black, nutty-flavored paste that’s safe to eat. 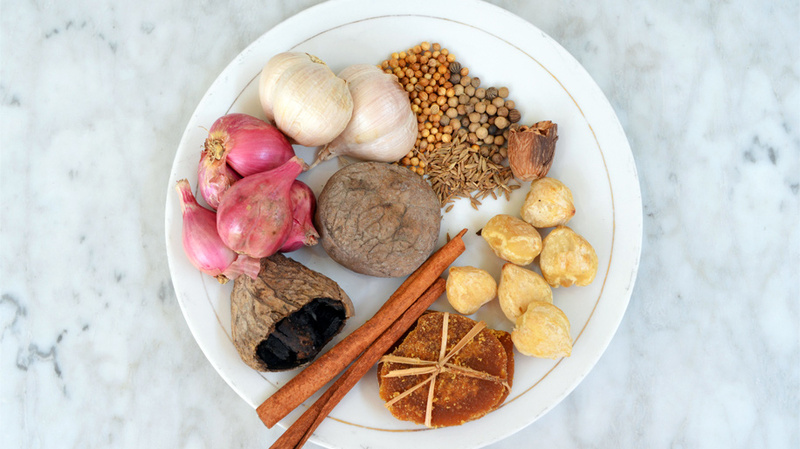 Other spices used to make rawon are garlic, shallot, candlenut, cinnamon, and nutmeg. Typically served with rice, rawon is garnished with fried shallots, prawn crackers, a handful of bean sprouts, sambal, salted duck egg, and kaffir lime leaves to cut through the richness. Perhaps it isn’t the most visually appealing fare, but that is true for much of the world’s best comfort food. A recommended place to try rawon while in Jakarta is Rawone – Rawon Dengkoel in Tanjung Barat, not too far from Pasar Minggu. If you’re in Surabaya, visit Rawon Setan (“devil’s rawon”) on Jalan Embong Malang to try the dish. You can’t visit Indonesia without trying sate (or satay)—meat skewers cooked over charcoal and doused with sweet soy sauce or peanut sauce. They’re around every corner in vendor stalls and food courts. However, a lesser-known variation, sate buntel, has gained prominence thanks to a vote of confidence by President Joko Widodo. The dish first received national attention when Jokowi, as he’s more popularly known, visited a sate buntel eatery on a trip to his hometown of Solo. Turns out he’s been a loyal patron of the dining joint since his days as the mayor of the city. So what exactly sets this sate apart from other kinds? 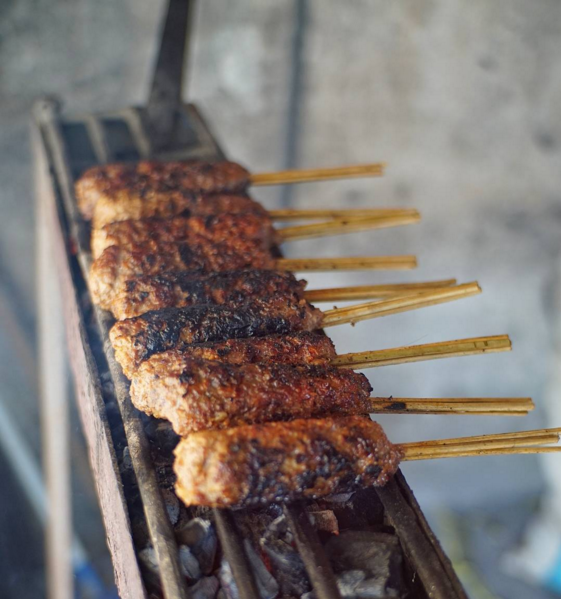 Unlike other variations, sate buntel uses spiced, oblong-shaped bundles of minced lamb on wooden skewers. And it’s wrapped with a thin layer of fat that melts while cooking, infusing the meat with mouth-watering flavor. What you get is a juicy and succulent treat fit for a president, or even a king! If you’re ever in Solo, definitely drop by Jokowi’s favorite, Sate Buntel Haji Bejo. You can also try it at Omah Solo in the South Jakarta neighborhood of Cilandak. Every morning, bubur ayam (chicken porridge) street vendors see to crowds of hungry people who eat the dish before officially starting their day. The most common porridge varieties are arguably bubur ayam kuah kuning (chicken porridge with yellow broth) and bubur ayam Hong Kong (Hong Kong–style chicken porridge). 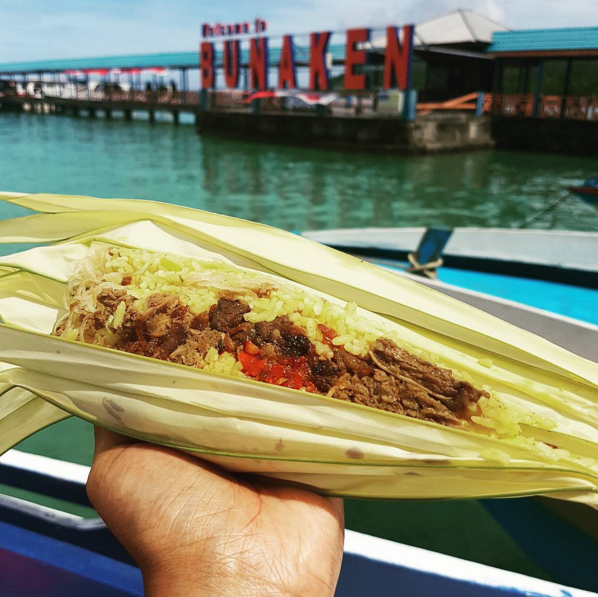 Those two are what you’ll find in big cities, but in North Sulawesi, they have a porridge dish that is completely different, yet it’s so good that it’s a favorite of one of the country’s former presidents, B.J. Habibie. 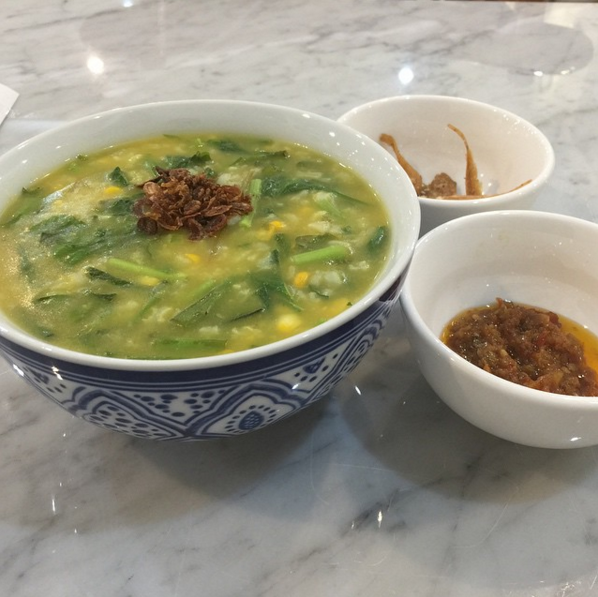 Tinutuan—also known as bubur Manado (Manadonese porridge)—is a congee made from rice, pumpkin, sweet potato, and cassava cooked into a pulp and mixed with corn and various vegetables. Top it with fried shallots, tofu, and salted fish and it’s ready to eat. One of the best places to enjoy it in Jakarta is Menteng’s Bunga Pepaya, but if you’re lucky enough to visit Manado, we’d recommend Cafe Dego-dego on Jalan Wakeke. Soto is Indonesia’s take on chicken soup—everyone’s mother has their own recipe, and everyone’s mother does it best. Each region and even each city has their own way of making it, but one common feature of soto is its rich yellow broth that is especially heavenly during rainy days. 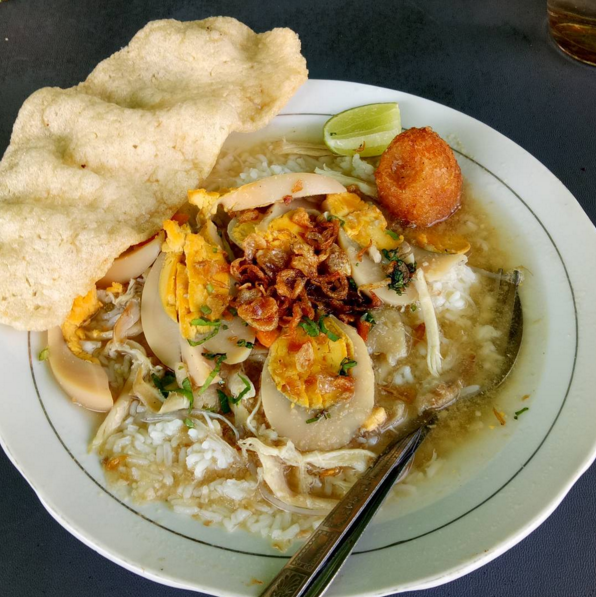 In Banjarmasin, South Kalimantan’s provincial capital, the local variant is soto Banjar, served with chicken, potato patties, a hard boiled egg, and ketupat (rice cake steamed in palm leaves). Though it’s made with the usual combination of garlic, shallots, and pepper, the defining feature of soto Banjar is the absence of turmeric and the addition of sweet spices such as cinnamon and nutmeg. What you get is a rich, savory broth with a heady aroma of warm spices—now that’s something we’d take any day, rain or shine. To get a taste of soto Banjar in Jakarta, head to the southern district of Cilandak for a meal at Soto Banjar Nyaman Antasari, or better yet, spice up a trip to Borneo by paying a visit to Soto Bang Amat in Banjarmasin.